Contributor Rae Ehly walks us through some of her favorite local spots to work up a sweat. One of the things that I love most about living an active lifestyle is that there is ALWAYS a new activity to try, new studio to visit, new friend to workout with and new ways to get involved in the fitness community. Plus, Kansas City’s health and wellness space is growing like CRAZY! I’m convinced that I drive by a new juicery, tea shop or fitness studio every week. Sunday is a day of rest for many people, but I consider it a day to kick-start the week ahead! Monday morning might not feel so s%*$#y when you’ve gotten a good sweat in the day before. Detox your mind and body from the weekend with a Vinyasa Flow or Relax, Relieve and Recharge session at Yoga Patch. Located close to the Waldo & Brookside neighborhoods, you can find the studio at 7235 Central Street. Photo courtesy of Mojo Cycling Studio. No better way (in my opinion) to start off the work week than to hit up Mojo Cycling Studio for a Power Ride. You can plan on getting your groove on for 45 minutes, and you’re guaranteed to leave feeling more inspired and motivated than when you arrived. Feel like sweating for longer than 45 minutes? Mojo offers 60-minute rides also– just don’t forget your water bottle. Located at 4722 Broadway Boulevard Suite #220. Photo courtesy of Health House. Yeah, I said “turn up.” On Tuesday, you’re one day further into the week, which means you're one day stronger and one day wiser, right? If you got a tough cardio workout in on Monday, it’s likely that your body will be craving something a bit different on Tuesday. Sign up for a Health House RIPPED class, where you’ll focus on strengthening certain body parts. There are two studio locations – making it easier for those that live south of the city. The Prairie Village studio is located at 3924 W. 69th Terrace, right by Dolce Bakery. The Leawood studio is located at 5029 W. 117th Street in Town Center. Halfway through the work week, and you’re likely feigning for some refreshing energy. This is a good low-strain day – a time to refresh and reenergize for the rest of the week. Maybe you’d like to try a “hot box detox” or “glow with the flow” class at Hagoyah, which doubles as a hair and yoga studio. Need a good reason to choose this studio over another? $5 yoga classes. Every. Day. Located at 515 West 75th Street. Time to boost that cardiovascular system one last time before Friday hits! Getting a mix of cardio and strength training in one sweat session can help you see results. 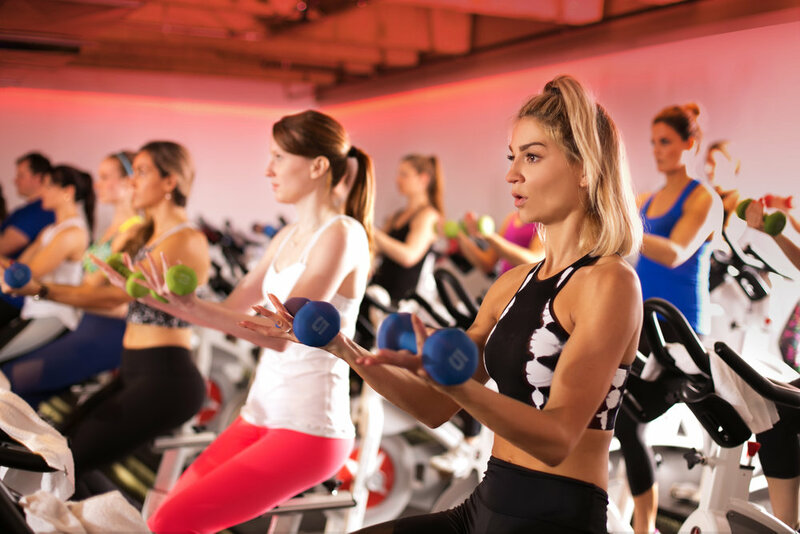 Fusion Fitness offers High Intensity Interval Training (HIIT), along with other dynamic classes like “Sweat Lab” and “Bikini Boot Camp.” You’ll hustle through cardio intervals, muscle-specific training and technique-driven movement. There’s no leaving here with unspent energy. See below for the three Fusion Fitness locations in Kansas City. Let’s be honest – after a long week of work and 5 days of physical activity, you’re ready for a glass of wine and a back rub. The cool thing about exercise, though, is that you can make it what you want. You get out of it what you put into it. So, if you get home on Friday and feel like lounging with a glass of wine; instead, grab your significant other and walk around the block with your cocktail, or spend some time out in the backyard playing corn-hole or ring toss. Whatever gets you outside and moving after a busy week! Photo courtesy of Freight House Fitness. Nothing is better than starting your weekend off without a hangover, and sometimes that involves a little detox sweat session. Saturday morning is the perfect time to get moving with good friends or a significant other. Grab a cup of coffee and head out the door to a boot camp at Freight House Fitness or City F.I.T. class at City Gym to sweat out Friday night. Didn’t go out the night before? Pick an earlier time slot for your workout so you have more Saturday to enjoy! Whatever your week looks like, make sure to prioritize movement. When we don’t, we end up feeling more fatigued and less motivated, and we’re less likely to feel engaged at work. Even if you don’t follow a fitness plan, or you’re not much of a group-fitness junkie, find a way to either get outside or get moving in your community! And if you’re looking for more recommendations or workout ideas, don’t hesitate to reach out to me personally at raeehly@gmail.com.